'All About Presentations' by Jazz Factory: What is wrong with Aircel's 'Save Our Tigers' initiative? What is wrong with Aircel's 'Save Our Tigers' initiative? I saw a TV ad today. It talked about how our planet was dying slowly. It closed with the statement; "We should save our planet." This advertisement strikes a chord with all of us. We all know that our planet needs to be saved. We all 'seem to care'. Yet, this ad is a massive failure. Because it does not make even 1% of us to act. We see, we feel bad and we forget. Because we don't know what we need to do. We are too busy with our lives. We are not being told what specific action we can take to save our planet. There is no call for action in this ad. This brings me to Aircel's Save Our Tigers initiative. This initiative is now a few months old and has created a lot of awareness. Aircel is a telecom service provider in India which is running a campaign across India where they are appealing Indians to save Tigers (our national animal). Aircel started the campaign with a bang. They came up with the catchline 'Just 1411 left'. It shocked many when they realised that a country of more than a billion has just 1411 Tigers. They used this message across TV, Billboards (Hoardings), Newspapers and other media. A good piece of communication. By being specific they made us care. 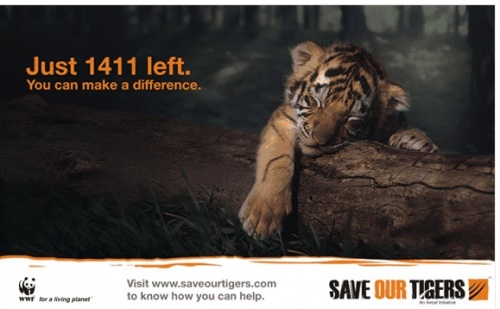 Imagine if Aircel would have said 'Save our Tigers' instead of saying 'Just 1411 left'. When you hear, 'Save our Tigers', you say "Yes, we should" and then you do nothing. By focussing on one number, they made the problem more realistic and specific and hence created a huge amount of awareness among the people. Where Aircel will fail is in getting people to act. Except donation there is nothing specific & concrete here. You are not sure what will happen by just spreading the word (other than giving free publicity to Aircel). On the NGO front, they urge us to find and join 'some' NGO which works for Tigers. They urge us to save paper and timber. We all know that we should save paper. The point is how? The campaign has left a lot to the initiative of the audience (the people). A lot of work has been passed on to the audience. This is the problem with this initiative. The purpose of any presentation (communication) is to get people to act in a certain manner. A sales presentation wants the customer to buy. A sponsorship proposal presentation wants the corporate to sponsor the cause. The onus then is on the presenter (communicator) to make it easy for people to act, because if they don't the loss is purely of the presenter. We must include a 'specific' call for action at the end of our presentation which will induce people to act. What do you think about this? I agree with what you say even though it is true that we are the ones who should take action but I dont think just a few 100 are enough to bring about a revolution. I too feel the issue is serious and needs to be addressed. What Aircel has done is to generate huge amount of awareness. I can see the ads everywhere on TV. My only worry is, will it become just another burning issue which we care about but do nothing about. It worries me. Aircel ran this concept just to match Idea's Go green marketing campaign. Seems Aircel has nothing to do with the campaign except creating a buzz in the market that they too do CSR activities. It seriously is a pain to see companies spending millions on campaign like this and ending up doing nothing.